Pure agitation is the lightest feeling one gets in Valencia when March arrives. It was the first week of March; I was crossing the street going to the art store, when all of a sudden I heard what it seemed to be firearms shots. I got very scared especially when some days before there were confrontations on the streets between kids from a high school and police men due to the fact that the city had cut the power and water of their school. I went straight home the quickest I could. Seating on the leaving room and almost out of breath I told Alberto (my roommate) what just happened. He was of course laughing and at the same time trying to let me know that “Fallas” had begun. Fallas means torch in the medieval Valencian, and is a huge tradition here. Several acts of celebration get together from the 1st day of March to be part of it. 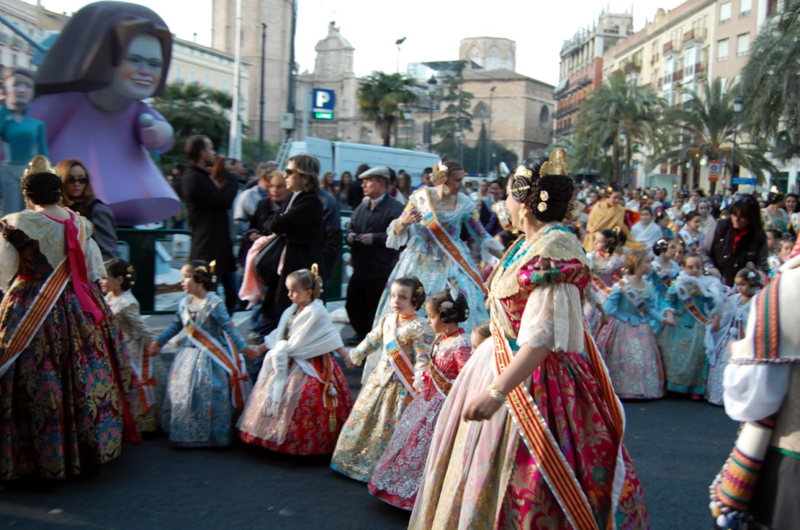 Fallas are known to be a motive to honor Saint Joseph for the father’s day in Spain is the 19th of March. People of all ages are constantly igniting firecrackers on the street all day long. This was what I heard when going to the art store that day. From the 1st until the 19th of March the City Hall organizes the “Mascleta”. Masclet is a valencian word than means firecracker and “Mascleta” is the act of igniting hundreds of these firecrackers in the center of the city for about 10 minutes. I am putting up a video of the Mascleta so you can take a look of the size of this event. You should watch the whole length of the video for the explosions increment the more time passes. The humongous sculptures you see in the pictures are called “Fallas.” Artists are working all year long building these Fallas to show them to the public for only 5 days. Every Falla, typically has a theme, and many of them take the opportunity to make a critic of the social or political system of the country. Virgin Mary is also part of this celebration. In the Virgin’s Square a very tall wooden structure with the Virgin’s head and Jesus in her arms is built so that the falleras go there with flowers and adorn the wooden structure making it look like a huge flower dress when is done. Here is a link with pictures where you can see this beautiful act. http://www.fallas.com/index.php/es/component/content/article/161-marzo-2012/9673-qflores-desde-el-corazonq. I am also putting up a video is this oblation. On Father’s day, the 19th of March, everything ends in a very peculiar way. Fallas are all burned down. There are more than 700 of these in the whole province. This forms part of the tradition from its beginnings, where people instead of making these elaborate sculptures, used to take their old furniture and make a pile outside their houses to burn them. This meant renovation, purification.